Makes an amazing salad dressing. Very good for really dry skin or hair. 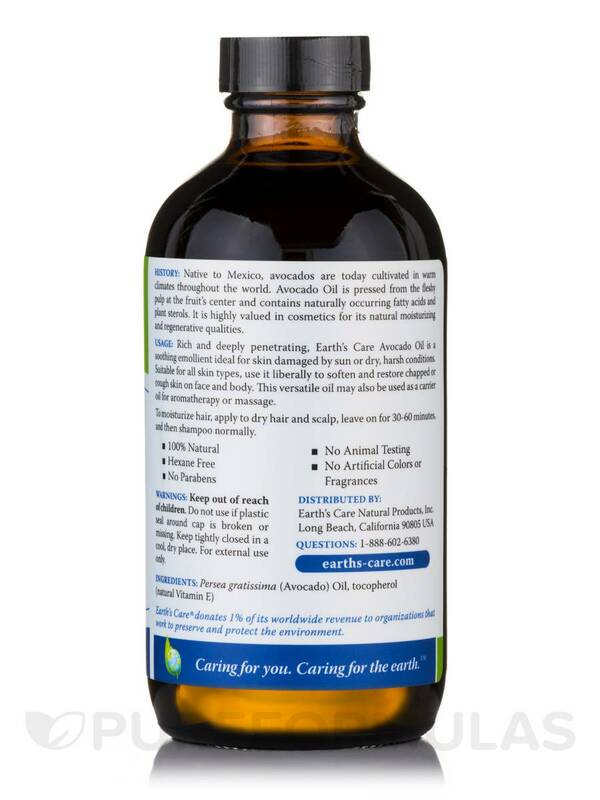 Avocado Oil by Earth's Care is an oil that is much healthier for your family. I put Avocado Oil by Earth's Care on my skin after I shower. My skin is pretty dry during the winter months and this has kept my skin moisturized and soft. Nourishing Moisturizer for Skin and Hair! Native to Mexico‚ avocados are today cultivated in warm climates throughout the world. Avocado oil is pressed from the fleshy pulp at the fruit’s center and contains naturally occurring fatty acids and plant sterols. It is highly valued in cosmetics for its natural moisturizing qualities. Rich and deeply penetrating‚ Earth’s Care Avocado Oil is a soothing emollient ideal for skin affected by sun or dry‚ harsh conditions. Suitable for all skin types‚ use it liberally to soften and restore rough skin on face and body. This versatile oil may also be used as a carrier oil for aromatherapy or massage. 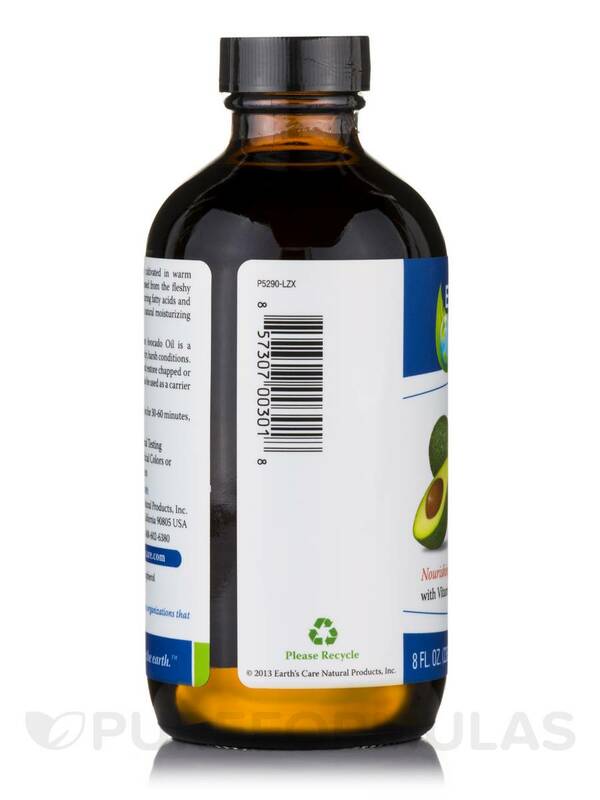 Persea gratissima (avocado) oil‚ tocopherol (vitamin E). To moisturize hair‚ apply to dry hair and scalp‚ leave on for 30-60 minutes‚ and then shampoo normally. Keep out of reach of children. Do not use if plastic seal around cap is broken or missing. Keep tightly closed in a cool‚ dry place. For external use only. I routinely do coconut oil masks for my hair, but adding variety is great for your hair and scalp, because it "switches it up" so to speak. 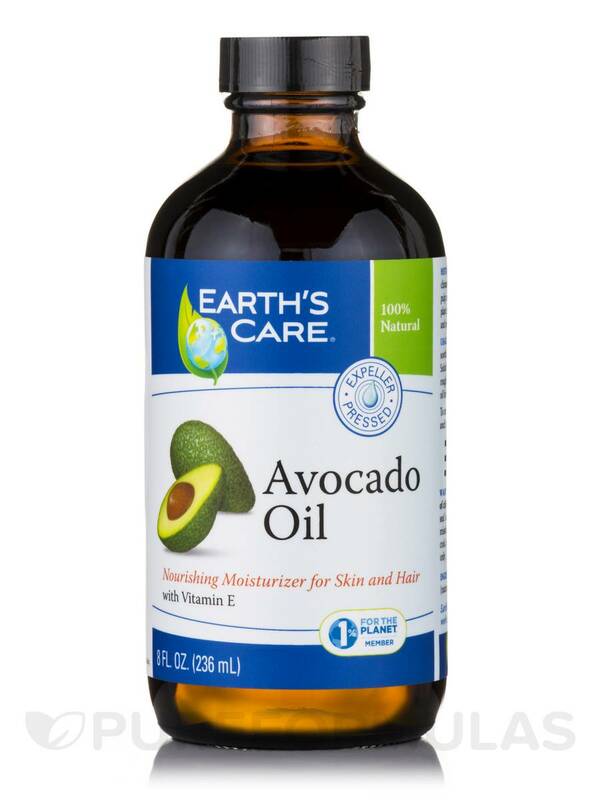 Avocado Oil by Earth's Care is a potent, affordable way to do a hair mask using avocado oil. I love how silky and strong my hair is for 1-4 weeks afterward. Great for your skin, hair and cooking! Wonderful quality for an extremely reasonable price! Wonderful oil and a super good price! Avocado Oil by Earth's Care is by far the best I have used in the past few years. Super fast shipping! 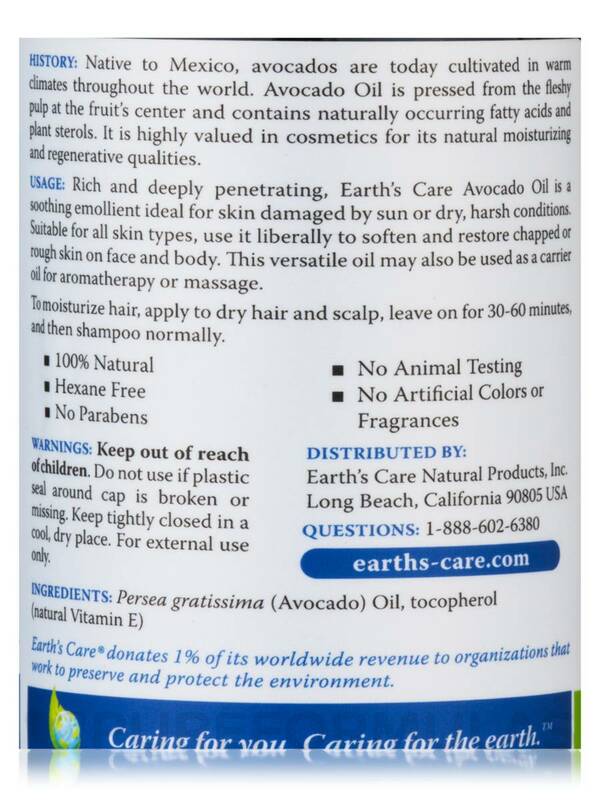 Avocado Oil by Earth's Care is not 100% pure. The label say for external use only. If it was 100% pure it would be safe to consume.